In communities built on ancient traditions, a number of customs are celebrated and festivals are held during the year, with those marking Springtime and mid-Summer being particularly popular and colourful. Every parish holds a feast to commemorate the birthday of its patron saint. Feasts are attended by local celebrations which usually last a week. Amongst such ancient customs surviving today are the Midsummer’s Eve Bonfire, and the Crying-the-Neck which celebrates the gathering in of the harvest. Both are open-air events and bilingual in English and Cornish. St Ives is one of two Cornish towns that preserve the old custom of hurling. Once a year, townspeople compete to catch a silver ball thrown from the harbour wall. St Ives also has its Knill ceremony, held at the monument to John Knill - one of the town leading citizens - every five years, and featuring a procession, dancing and the distribution of charity, as laid down by John Knill in his bequest. In Mousehole, Tom Bawcock’s Eve is celebrated annually on 23 December, with Starry Gazey Pie - a feast of fish - and in recent years, on the initiative of Kneehigh Theatre, a lantern-lit procession of children, musicians and dancers through the village. Visitors join locals to celebrate the landing of fish by Tom Bawcock, which saved villagers who were close to starvation, when storms had prevented other fishermen from leaving harbour. 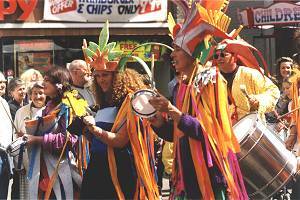 In 1991 Penzance’s Mazey Day at the end of June was celebrated for the first time, reviving the St John’s Eve celebrations abolished in Queen Victoria’s reign. Mazey Day is now the climax of Golowan Week and the Golowan Festival, when large numbers of visitors join local revellers to take part in the music, dance, drama, and pageantry of this truly community festival. August sees the Newlyn Fish Festival which celebrates the value and importance of the fishing industry - both past and present - to the local community. Fishing boats in the harbour are decked with flags and there are spectacular displays of fish, while the quayside is thrown open to craft markets and entertainment. In September the St. Ives Festival brings together musicians, artists and writers of the highest calibre from all over the country, and beyond. Performers like George Melly, June Tabor, Elaine Delmar and Four Men and a Dog cater for all kinds of musical tastes and appeal to audiences young and old.